A few months after trying to have Israel suspended from FIFA, Jibril Rajoub meets Israeli counterpart Ofer Eini. A few months after he waged a bitter battle against the Israeli Football Association, the chairman of the Palestinian Federation Jibril Rajoub on Wednesday met with his Israeli counterpart, Ofer Eini. The meeting between the two, in which they were photographed shaking hands, came as a FIFA panel aiming to improve Israeli-Palestinian soccer relations met for the first time. The Associated Press (AP) reported that panel chairman Tokyo Sexwale, a South African businessman, hosted the two football federations' leaders, FIFA said in a statement. 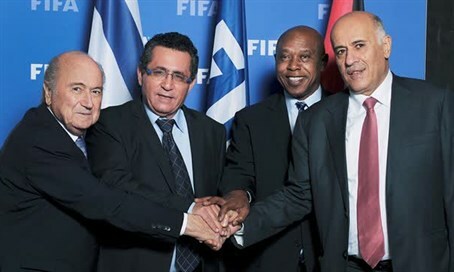 Sexwale was appointed in May after Rajoub dropped a request for the FIFA Congress to vote on suspending Israel. "I'm feeling confident after seeing the team spirit today, as both associations have confirmed their intention to promote dialogue," Sexwale said in a statement quoted by AP. "As we have witnessed in my home country South Africa, I'm convinced that here too we'll bring people together through the power of sport." "I'm very happy to start the process towards finding solutions," Rajoub said in the FIFA statement. Eini said that "both Mr. Rajoub and I want fair conditions for our footballers." FIFA said the panel planned to meet in the Middle East region in September. Rajoub had campaigned to have Israel suspended from FIFA because, he claimed, Israel was restricting the movement of Palestinian Arab players. However, he withdrew the bid at the 11th hour, sparking anger among Palestinian Arabs, some of whom have demanded Rajoub’s resignation. Rajoub later said he intends to try to have Israel suspended again in the future. "I hope that the Israelis understand that the suspension has not been removed from the agenda of FIFA but the sanctions were postponed until the committee that was established completes its work,” he said, adding, "Soccer players and fans in Israel should pressure their racist government. We will assess the situation and see if Israel changed its tune and if not - we will move forward." Rajoub, who is senior member of Palestinian Authority chairman Mahmoud Abbas’s Fatah movement, is known for his inciting statements against Israel, which include claiming in a television interview that Nazi leader Adolf Hitler could have learned from Israel about extermination camps. He has suggested in the past that Israel "should be removed", and last year supported Hamas's threats to kidnap IDF soldiers on PA TV.